In a recent post I mentioned incorrect use, or no use at all of the baseline functionality in Ms Project. In this post I would like to dive deeper into baselines from an application perspective. So in Project management, you would be ok with just 1 baseline, because you have only one Original range? Not quite. Just think about scope changes in a project, within range of say 5% of the budget, time or quality it’s all acceptable. But once you exceed this line you’ll need new budget, resources or time. When ever you have a scope change that needs official approval, you want to set a new baseline. A new view of the range your project can operate within. In that light: do you want to manage a project that had 10 scope changes? Or would it be wise to kill the project and start with a new one? 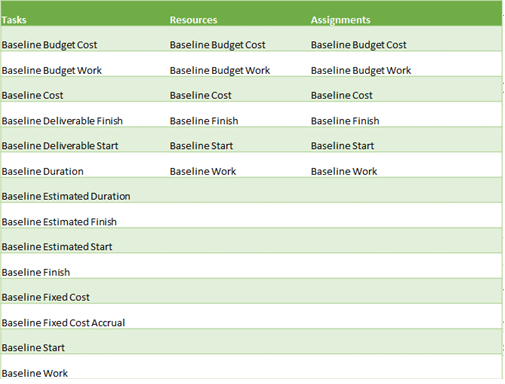 The baseline plan is a snapshot of your schedule at the time that you save the baseline and includes information about tasks, resources, and assignments. (source, applies to Project 2003 and up). Now why are all assignment fields the same as the Resource (and Task) fields? Assignments can’t exist without them. The fields above are also time phased when applicable. Very important to know what is stored, but maybe as important to know what isn’t stored! Only the fields mentioned above (including their 1 to 10 brothers and sisters) will be filled with information. So deleting a task or resource or assignment will also delete all the information stored on that row! including all baseline information! Also if you change the name of a task you will not get an overview of all previous names. I can’t think of a solution for the changed name dilemma but there is a solution for the deleted tasks: Don’t delete them 🙂 just make them inactive, this is a functionality that is added since Project Professional 2010. A inactive task has all the information still stored within the rows, but will not count when you make a report on your schedule. If you ever need that information back in the schedule, just reactivate. Now we will have a closer look at our friend “Baseline”, sometimes called “Baseline 0”. This one will show up by default when you select the tracking Gantt view. Now I say default, but you can manipulate the view to show just about any baseline you want. You can also ad any of the baseline task columns (mentioned above) in the view. And you can make Resource and/or assignment views showing baseline data as well. So build your own view that suites your needs. Make your manager want that baseline data. Have multiple baselines? That doesn’t matter, have a look at this guest post by Bonnie Biafore. Allows a user to save a protected baseline or clear a protected baseline associated with an enterprise project published to the Project Server database. Grant this permission to project managers who have to save baselines in their projects. Baselines are saved by using the Set Baseline functionality accessed from the Project Professional ribbon on the Project tab in the Schedule group. Click the Set Baseline button and then select Save Baseline or Clear Baseline. Protected Baselines are in the range of Baseline 0–5 inclusive. Only users who have Save Unprotected Baseline, Open Project and Save Project Category permissions are able to save Baselines in Baseline 6–10. That means that your company can use baseline 0 to 5 to build centralized reports and that you are free to use numbers 6 to 10 for your own goals. I hope you liked the post, let me know if I missed some crucial information or if you like me to post about anything else. You can now sign up to my newsletter read about the newsletter here. Have a great day and thank you for reading! I think that for those who need more than 11 baselines, then they should probably re-think their career as project managers. PS: While reading the part “What is not stored in the baseline” – I became more convinced that MS Project is a far-from-perfect product. Even after many years, it still didn’t address the basic issues that project managers complain about. Thank you for your (harsh)reply. I do agree with the first one, more then 11 baselines should be nonsence in almost any case. “Almost” and that is why I think Microsoft added this amount, because it want’s to provide a solution for the biggest group of people. The second remark you make sounds like a grudge you got. I have found that making tasks inactive in a schedule solves most of the “basic issues that project managers complain about” in regards to the baseline. However, I would love to hear your thoughts on them and would like to continue this discussion trough mail if you are willing to do the same. Maybe there is another nice post subject to be discussed :). I also think its a harsh statement from PM Hut. Just think if its not the project managers who need 11 baselines, but the organization they work for. It´s really simple to think of a case where that might happen – once you implement a workflow for your projects with several phases and the organization asks for a baseline to mark the end of some of them (proposal, budget approval, etc … all even before execution), you easily consume all the available baselines and ask for more. Hi Dominic, that sounds like a great follow up post. I will consider it and will keep you informed about progress. I have created the post: please visit here. Thanks for those valuable informations. I am conflicted on how to create a baseline for a project. Which of the following scenarios would be considered a “best practice” for creating a project baseline in which to measure progress and get some schedule-related EVM metrics? Is Primavera Really usefull for this process, What you did was exactly what I suggested??? Thank you for reaching out to me. However, I don’t understand the comment due to 2 things: There are no scenario’s mentioned in your comment. And the product I’m using is not Primavera, but Microsoft Project. Next Next post: Internet Explorer 11, Windows 8.1 and Project Server 2013.